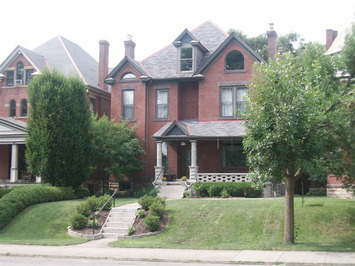 3 Story Victorian ON Goodale Park! Living Area: 3,314 Square Ft.
Rare Opportunity to Own One of Columbus's Prized Homes Right ON GOODALE PARK! Perhaps once in a decade does the opportunity to own a wonderfully renovated Goodale Park Mansion come along! Fabulous architectural features. 3 Bedrooms plus spectacular open 3rd floor, 3.5 Baths. 6 gaslog fireplaces. Center Hall w/twin parlors & open stairway. Gorgeous Oak floors & woodwork. Incredible Cherry, Granite & Stainless Steel Kitchen with peninsula. Bonus 1st Flr Family Rm. Wonderful, private, manicured yard. Huge Master with fluted column fireplace, walk-in closet & phenomenal Master Bath with 2 head shower, Ivory Porcelain tile & Limestone top vanity. 3rd Floor is perfect Media Rm, Office, Studio or 2nd Master Suite with incredible 3rd Full Bath. Basement workshop and exercise room. 2 Car Garage, updated mechanicals, new roof & much much more. Outstanding!